Organizations that have used our Services. Organizations who have used our Transit Training Services. Leadership Dynamics Group, a management development company, headquartered in Houston, Texas, specializes in people development ... primarily in the training and coaching of executive, professional, managerial and supervisory employees--because ultimately the success of any business hinges on the performance of its people. Whether you are a sole proprietor, sales manager or Fortune 500 executive, you can improve your professional performance. increase productivity and reduce your stress level as over 500,000 key employees around the world have done. Our performance and learning system is the key to helping you succeed. Look at this Four Stages of a Company's Growth Chart to see where your company is now, and what should be accomplished to reach the next level. Then let us be a part of aiding you to arrive at that next plateau of achievement. 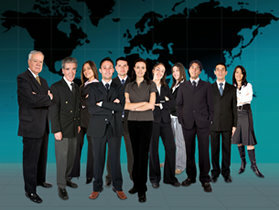 Used by more than 500,000 participants in the USA and 70 countries around the world for nearly 40 years, the Leadership Dynamics Group management training process helps companies and individuals develop the leadership and management qualities necessary to increase their personal and corporate productivity. Participants refine their skills, and apply the techniques and concepts contained in the curriculum for each program. There is no quick fix. For a person to do something different requires modifying behavior, and behavioral changes only occur over a period of time. The Leadership Dynamics Group process to make those changes is based on spaced repetition, multi-sensory learning, group dynamics, goal setting and the triangle of communication. Each participant enrollee participates in weekly, on-site, interactive sessions emphasizing their accomplishments for that period. Because Leadership Dynamics Group clients are both national and international in scope it is imperative that high standards of Leadership Dynamics Group facilitation be consistently maintained. To ensure that each client receives the highest level of service and support, our facilitators are certified by Leadership Management, Inc., and Leadership Dynamics Group. You have a wide choice of managerial training programs, individual coaching and employee workshops to help key employees develop that slight edge needed in today's competitive market. Research has shown that external management development specialists can readily gain the confidence of employees. The employees then share more honestly in openly discussing issues and challenges which becomes an opportunity for corrective action. This is particularly true with mid-level and senior executives, and is exactly the learning process we apply. To learn more about how the our performance and learning process works please see Why Were Different. A view of programs offered can be seen at Programs. Information about our parent organization, Leadership Management, Inc. can be viewed by visiting their site at www.LMI-USA.com.